It is surprising that a drummer would release an album of songs, especially when he doesn’t sing himself. However, what Sean Noonan has produced is a soundscape that includes vocals. Working with Noonan musical ideas, Marc Ribot joined fellow guitarist Aram Bajakian, Jamaaladeen Tacuma on electric bass, Senegalese bassist Thierno Camara, Mat Maneri on viola, Thiokho Diagne (also from Senegal) on hand percussion, and Abdoulaye Diabate on congas to play on this CD. The work is often chaotic and atonal, letting experimentation rule, but at times it comes together in a brilliant harmonic fusion. While the musical gumbo produced by these talented musicians would be enough for any album, Noonan also enlisted the pipes of three people to act as a spicy roux to bind all of this experimentation together. Camara, Diabate, and Susan McKeown had their unique voices to the blend, creating a marriage of African and Celtic stylings. These vocals are sung in Gaelic and in the African languages native to Camara and Diabate. Noonan only wrote short lyrics for a couple of tunes, and some he wrote poems for them but they only appear as liner notes. Those he wrote for “Boxing Dreams,” however, were translated into an African dialect and reinterpreted by the singers. Susan McKeown found several pieces of Irish poetry to use as lyrics for some of the other songs. For example, Noonan wanted to write a tribute to Rocky Marciano, the hero of his hometown. So, McKeown found an invocation on an ancient Celtic breastplate and sung it in Gaelic for the track, “Courage,” while an African voice intoned Rocky Marciano. Some of her other choices were also sung in both Gaelic and in an African dialect. Noonan also twisted some melodies. For example,”Big Mouth,” whose lyrics came originally from a Celtic song called the “Song of the Tea,” was totally revamped to have an Afro-pop feel even though it does feature the Gaelic words sung by McKeown sandwiched in between the African music. Noonan often uses this kind of fusion of voices as instruments, just as he would a guitar or keyboards. As you would expect, though, some of the finest pieces are the instrumentals. For example, “Mayrose,” a tender elegy for Noonan’s grandmother has a distinctive Eastern European feel from Maneri’s viola and a lovely guitar line. And amid all of this Afro-Celtic fusion Noonan enjoys, he injects a folky, bluegrassy rendition of “Casey Jones” in his “Story of Jones.” Using the traditional words, Noonan has totally revamped the melody into a twangy sensitive version that melds into jazz and rock about halfway through and then returns to its folky roots. Here again, the lyrics are never sung. This cut is really, really nice. The last two cuts are particular studies in improvisation. “Over-n-Out” is a nice jammy, jazzy improv that gets all of the musicians involved. Here Maneri’s viola is showcased well. The last track, “Lost in Gunter’s World” does have some liner notes, but, again, this one does not feature any vocalists. This cut dips into experimental jazz that goes out there and features more guitar and drum work. 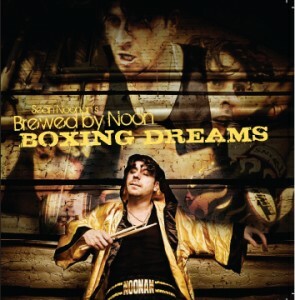 I was very impressed with Boxing Dreams by Sean Noonan’s Brewed by Noon. The collaborations are very unexpected, instrumentally, lyrically, and vocally. Noonan shows us that improvisational music, whether rock or jazz, is a lot more than just getting far afield from a melody. It is incorporating whatever a group of musicians can offer, letting them shine in places and moving them to the background at other times, always keeping the integrity of the song. Noonan has said in many interviews that Boxing Dreams, like his previous Stories to Tell (2007), is a way to become a musical storyteller. In that, Noonan has certainly done that, by crossing genres and cultures. Boxing Dreams has much for the listener to discover. Beer Pairing: Summit Spring Sampler (Maibock, Extra Pale, India Pale Ale, and Porter)–There’s something here for every taste.